This collection covers all tastes from dry to sweet. 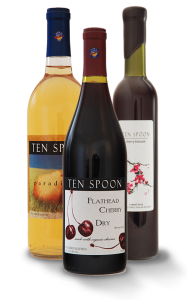 Our legendary Flathead Cherry Dry is bone dry with a satisfying depth of taste; Paradise Pear is off-dry, just a hint of pear sweetness; and Cherry Blossom is a sweet, rich dessert wine. A perfect selection to please several palates and occasions.